We love biking! As a family, biking has always been a part of life. Our boys are growing up thinking that it is completely normal to hop on the bike and buckle their helmets instead of getting into a car. We made the transition into car-freedom in October 2012, about 6 months after we got our first cargo bike. This bike changed our lives! Suddenly, we realized that we could do just about anything without the car and it was much more enjoyable than driving. We run errands, commute, transport our kids, groceries, and friends, go on trips, go camping, and ride around having lots of fun by bicycle. We have added a few more Bike Friday bikes to our fleet--the Haul-a-Day, New World Tourist, and family tandem we call The Crazier Train. My hope is that we are able to share with others the joy of using bikes as transportation, entertainment, and exercise. Most importantly, I just want to show that it is not only possible to choose pedaling over driving, but it's actually easier than you think. 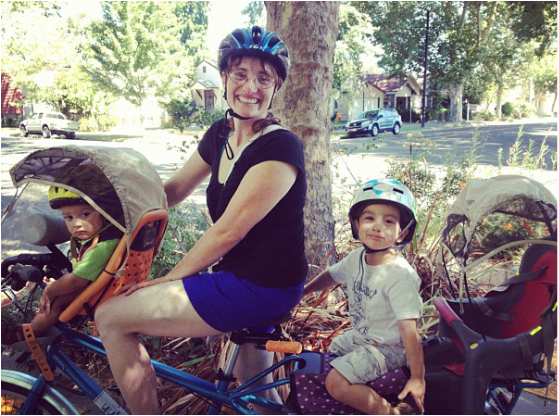 Since jumping into a car-free life, I have also started helping organize Sacramento's monthly Kidical Mass rides, become an LCI through the American League of Bicyclists, teaching pedestrian and bicycle education to elementary school children through Safe Routes To School programs, and teaching bicycle clinics through some of the local TMAs. Biking is my passion and it is wonderful to be able to fully immerse myself in this slower-paced, healthier, less expensive, exciting, and adventurous lifestyle. I love sharing the benefits of bicycling with my friends and family, as well as our greater community. 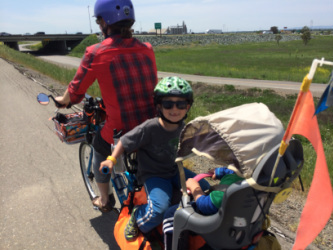 Kids are traffic, too! Check out our Facebook page. This has become just a rough estimate because I ride too much to keep exact numbers now.